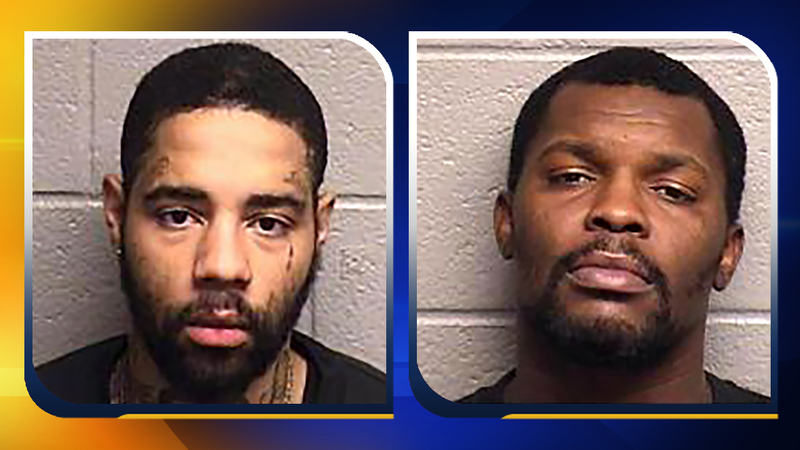 DURHAM, North Carolina (WTVD) -- Durham police investigators arrested two men on Thursday in connection with several crimes in multiple counties. Durham officers arrested Johnathon Durell Burton, 25, and Tyree Edward Mills, 27, of Durham. Burton, of Pittsboro, is a suspect in a Jan. 2 armed robbery at the UC Stop at 710 South Alston Ave. The suspect fled the store with cigarettes and cash. Burton has also been charged with committing armed robberies in Wake and Chatham counties. Burton is charged with robbery with a dangerous weapon and possession of a firearm by a convicted felon in connection with the UC Stop case. He was also charged by Durham officers with maintaining a vehicle for the possession or sale of controlled substances, possession of marijuana with the intent to manufacture, sell or deliver, possession of drug paraphernalia and assault on a government official. In addition to the charges from Wake and Chatham counties, he is wanted on a parole violation. He was placed in Durham County Jail without bond. Mills is facing robbery charges in Wake and Chatham counties. He is being held without bond in the Durham County Jail on fugitive charges from Pennsylvania.